New Technique Generates Free-Floating 3D Images. Just Don't Call It a Hologram. 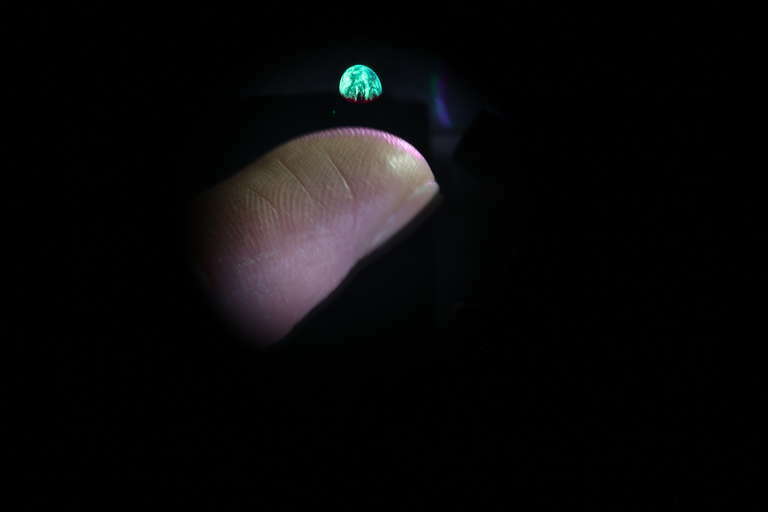 Engineers at Brigham Young University have produced 3D images entirely out of light. For more than 40 years now, researchers and optical technicians have been trying to create a so-called “Princess Leia hologram” — a free-standing, 3D-image projection made entirely of light, like the famous scene from the original Star Wars movie in 1977. Clearly, it's much more difficult than George Lucas made it look. But new research published in the journal Nature suggests that engineers are one step closer to achieving that goal. Using a technique called photophoretic optical trapping, researchers at Brigham Young University have developed a projection system that produces small, full-color images that float in mid-air. The system does not require any projection surface or special glasses, and the image can be seen from any angle. As such, the result is technically referred to as a three-dimensional, free-space volumetric image. That's the scientific term for the kind of “hologram” that's been popularized in science fiction movies like Star Wars, Avatar, and Iron Man. Scientifically speaking, holograms represent an entirely different kind of technology in which a 3D image appears to pop out of a flat screen — for instance, those shiny logos on your credit card. 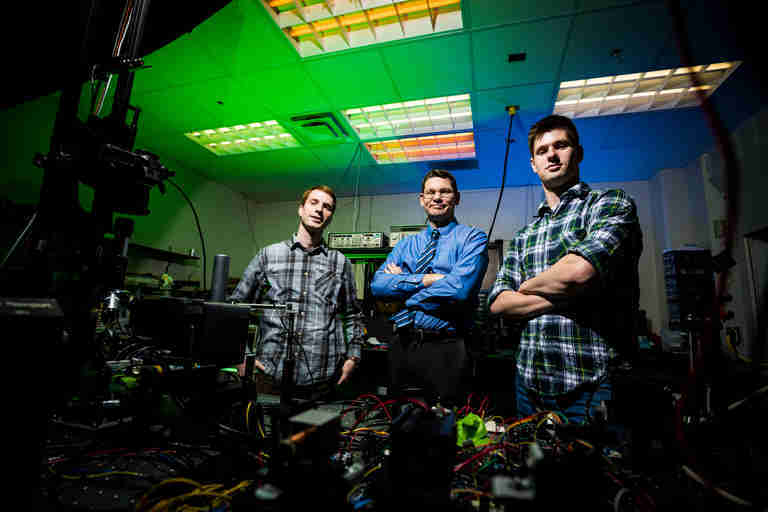 Speaking from his offices in Provo, Utah, BYU engineering professor Daniel Smalley said that clearing up the confusion around holograms and volumetric displays is the first step to understanding the new technology. Smalley and several students in the university's college of electrical and computer engineering worked together to develop the new method for generating free-standing, volumetric images. In fact, the team has been quietly working on the new technology for several years now. The optical trapping technique works by capturing and suspending tiny physical particles in mid-air using special projection lenses. The lenses actually create a “hole” of cool dark air within a circle of warmer illuminated air. When the particle approaches the perimeter of warmer air, it is repulsed back to the center. These floating particles then become the “screen” for a second set of laser projectors. When targeted by tightly-focused laser beams, the particles scatter light in all directions. Move the particles fast enough, and you can draw lines of light in thin air. The system can generate different optical effects, colors and images by using different kinds of materials for the projection particles. Optical trapping itself is not new, Smalley said. For now, Smalley concedes that the technique is relatively limited. Projected 3D images are very tiny indeed — smaller than your pinky nail. But the system can create larger “paper doll” images that appear two dimensional, even though they're technically a few dozen microns thick. In fact, the research team has generated a flat image of the original Princess Leia scene as an homage to the kind of sci-fi imagery that inspired the project in the first place. The challenge now, Smalley said, is to increase the size and resolution of the projected images. As to whether we will someday be able to generate those big sci-fi displays, Smalley is optimistic. Smalley hopes to improve the size and resolution of images by a factor of three or four in the near future. The real trick, he said, will be getting multiple projection systems to work in parallel and will allow for images much larger and more detailed that what can be generated now. For now, Smalley said he will be content if he can just get people to stop calling his images holograms.